You planned months or years in advance. You started cooking at home, skipped happy hours and (gasp!) canceled Netflix to stockpile savings. You stressed over logistics. You created an itinerary that hit every must-do from morning until night. You spent months stalking jet-setters on Instagram. You read your 20th “How to pack in a single carry on” article and still ended up checking in an over-stuffed bag. You curated the perfect travel outfit–no belt, slip on shoes, layers. Check, check and check. Kinda sad, and very tired, you make your way home, wondering how it flew by so fast. You checked everything off your must-see list. Your camera roll reached max capacity. You had a blast, but deep down, you were hoping to come back with a new lease on life, and well, happier. When you run yourself ragged checking off a tourist checklist and snapping that next Instagram shot, you miss out on the chance to disconnect from your thoughts and try a new mindset on for size. By slowing down and giving yourself the space to reflect on your life from a new country, and through the eyes of a different culture, you give yourself the biggest opportunity for personal growth. 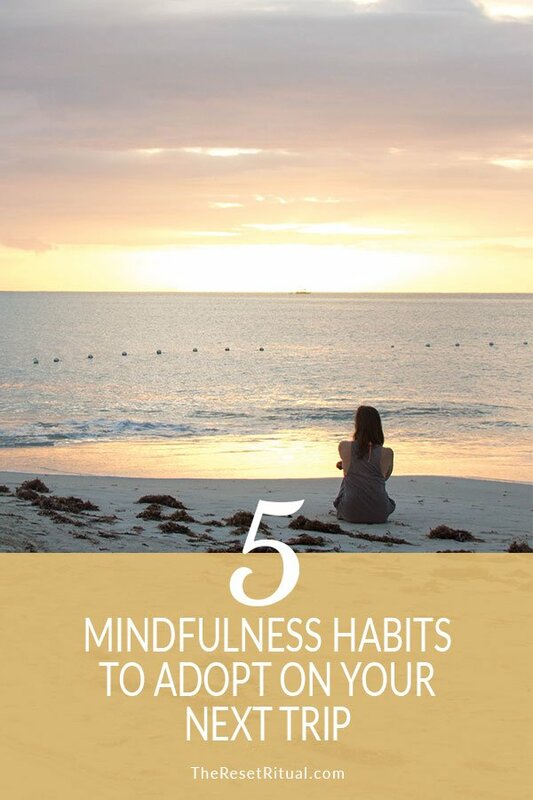 Here are five mindfulness habits to connect with yourself, tap into your travel experience and come back happier from your next trip. The early morning, when it’s still peaceful, is my favorite time to wander. Get up before your travel mates and take a walk. Soak in the city before it fully wakes, see yourself there, reflect on what it would be like to be a local. What would that mean for you? What would your life look like? Take the time to see the city through unfiltered eyes, without the influence of your companions or tourists. Instead of swooping in and hitting all the must-see spots in a whirlwind and taking off again, make sure to include downtime in your schedule. Go to a coffee shop or restaurant or park and hang out where the locals do. Have no agenda. Be open. Watch daily life unfold in front of you. Bonus points if you strike up a conversation with a local. There are so many alternatives to large hotel chains…Airbnb, couchsurfing, international house sitting, homestays, locally owned bed and breakfasts. Get to know your host. Go shopping at the local market. Stroll the neighborhood. Eat at local restaurants. What about living the local life do you love? What makes you uncomfortable? (Be honest!) What did you learn about yourself that can translate into your life back home? Even if you’re not the adventurous type, do something that’s outside your comfort zone, like bungee jumping, parasailing or eating a new food. I rode on the back of a scooter in Vietnam and that scared the bejeezus out of me. I mean, have you ever seen the streets of Ho Chi Minh City? I was white knuckling the seat, hanging on for dear life at the beginning, but as the day went on I began to actually enjoy being in the midst of madness. In fact, it felt pretty exhilarating. Photography’s a great way to capture the essence of your trip, but journaling captures the lessons from your journey. Your journal is your safe zone. It’s where you can privately air your grievances, tell yourself the truth about what you’re experiencing, and dive into the feelings and habits your trip is bringing up for you. Do you already practice any of these tips on your travels or have favorites of your own? Share them in the comments!